On March 16th, the CSLC welcomed Dr. Ann Devitt for a lecture on Semantic Networks: What they are and how they can help us in the classroom. Dr. Devitt is an assistant professor at Trinity College Dublin’s School of Education, and is currently a Fulbright TechImpact Scholar at the University of Michigan Ann Arbor where she is working with Professor Nick Ellis’ Language Learning Lab. Dr. Devitt’s research focuses on language learners’ semantic networks, which are visual representations of connections between words. For example, many language learners’ semantic networks would include a link between the words “dog” and “animal” because they know that dogs are animals. Language learners may also have a link between the words “dog” and “walk” – for example, because they know that dogs go for walks, or that dogs are animals that walk. To illustrate the power of semantic networks in action, Dr. Devitt incorporated a mini Irish language lesson into her talk at the CSLC. Dr. Devitt taught attendees a group of Irish vocabulary words. The participants then practiced them using a variety of repetition techniques, including simple verbal repetition, using images, acting out words, and making flashcards. In addition, attendees mapped out their own semantic networks for the Irish words by sorting them into categories. The new Irish aficionados then used their new vocabulary to decipher an Irish-language version of The Fox and the Crow. 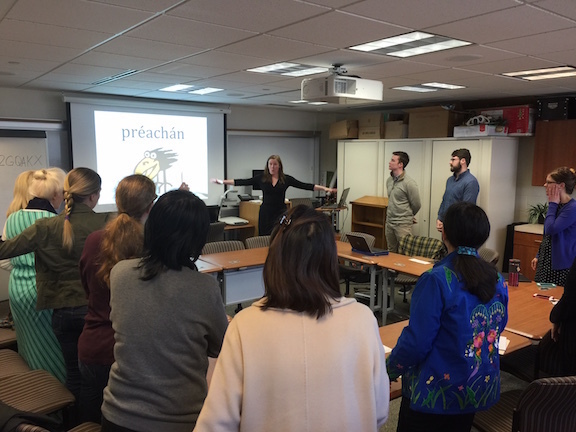 During the language lesson, Dr. Devitt used a variety of multimedia elements to facilitate learning, including slides and visual representations of words, as well as an online poll to assess attendees’ comfort level with their new Irish vocabulary. Speaking to the benefits of Computer Assisted Language Learning (CALL), Dr. Devitt says “I have seen students who are more enthused, more motivated to try to use the language, more motivated to practice elements of the language. With some technologies, students get quicker and better feedback to move them forward.” The multimedia elements incorporated into this presentation accommodated a variety of learning styles, and participants added approximately 15 Irish vocabulary words to their vocabularies in 20 short minutes. Although more repetition would be necessary to cement these words in learners’ long-term memories, the exercise clearly demonstrated the benefits of repetition and using a variety of repetition techniques. As participants discussed the language lesson, they agreed that different forms of repetition had been instrumental in acquiring their new Irish vocabulary. However, it was a little harder for them to decide which words they had learned most easily or quickly. One professor in attendance noted that simple nouns were a lot easier for her to remember than more specific nouns, and many attendees agreed that this seemed to be true. However, more research is necessary to support this anecdotal evidence. As Dr. Devitt continues with her Fulbright TechImpact award, she hopes to gather data that will help answer these questions and illustrate general trends in semantic network development for English language learners. 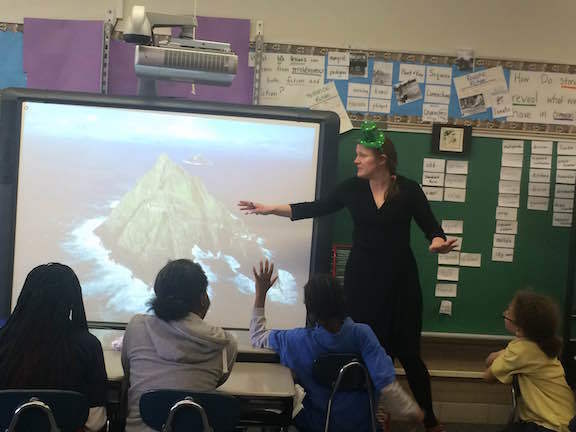 In addition to her presentation at Notre Dame, Dr. Devitt also gave cultural presentations to two fourth grade classes at Perley Fine Arts Academy, a local elementary school the CSLC partners with for a language and cultural immersion program. Speaking about the presentations, Perley teacher Melissa Glenn noted, “we value the opportunity for our students to become more global thinkers, and become more accepting of those who are not exactly like them.” Dr. Devitt taught the Perley students about Ireland’s geographic location, size, important cities, and notable places like Giant’s Causeway and Inis Mean, an Irish-speaking island. In addition, the students learned to say “thank you” in Irish (go raibh maith agat). The CSLC would like to extend a heartfelt go raibh maith agat to Dr. Devitt for her work at both Notre Dame and Perley. 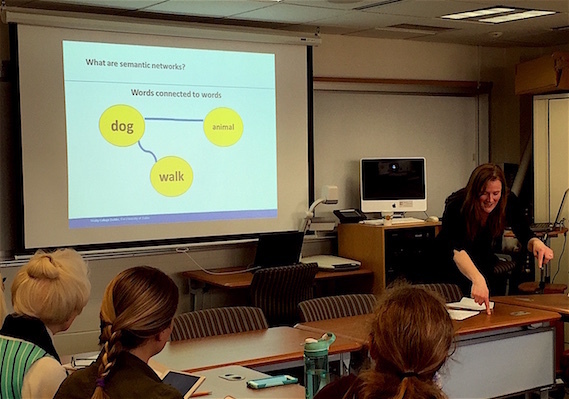 Dr. Devitt’s research on semantic networks and the ways language learners make connections between words was very enlightening, especially for the language professors and students in the audience. The CSLC is dedicated to supporting language students and faculty at Notre Dame, and a list of upcoming language talks and events can be found on the CSLC’s news and events page. In addition, the CSLC welcomes faculty suggestions for future talks. Originally published by Anne Daly at cslc.nd.edu on April 22, 2016.